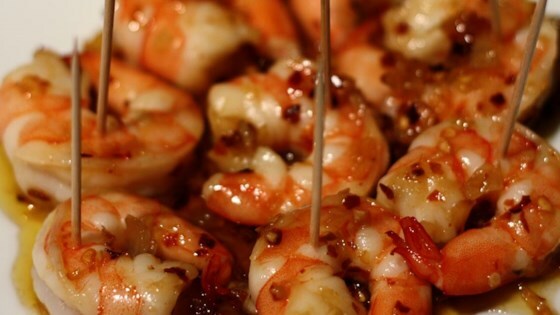 "This quick and easy, sweet and spicy dish combines honey, ginger, shrimp and garlic, and can be served over steamed vegetables or pasta." Heat the olive oil and red pepper flakes in a large skillet over medium heat. Add the onions, garlic, ginger and honey; cook and stir until fragrant. Add the shrimp, and cook for 5 minutes, stirring as needed, until shrimp are pink and opaque. Serve immediately. Crispy, sweet, spicy and irresistible! Loved it-would add coconut milk and chicken broth next time but very good. This is a delicious recipe. I find that the ginger, garlic, honey combo tastes great on anything. I used it to marinate pork tenderloin all the time.